The All Purpose Dragon Age Cosplay Thread! I had asked the Admins for a Dragon Age subforum, but I don't think it will get one, so in lieu of that, I'm making a happy thread! This is a thread for all things Dragon Age - progess photos, completed works, questions, answers! These are beautiful (and often stupid difficult) character designs, and having a thread where we can toss ideas and comments around will very much help! I'll start this thread here with some photos of my work over the past year and a half. I've completed and mended a Mage Champion Hawke cosplay, and even did both genders, Marian AND Garrett! I'm also planning a Warden King Alistair cosplay in the future, and I have a makeup test for him. I made a Josephine costume for a friend as well! Two others and myself are also going as the advisors at Halamshiral, and I just started constructing the coat for my partner, who is our Cullen. For Hawke, I had to draft my own patterns, or modify some existing ones, to get the look that I was wanting. The armor patterns were shared with me by a friend, and I resized them for my own measurements, or straight out had to draft them in the case of the sabatons. I used silk, goat hide, cow hide, faux fur AND rabbit fur, and cotton denim in the construction of the soft parts of the costume, and the armor was all worbla and craftfoam. Even the chainmail was actual steel chainmail - woven by me in the first rendition, and modified from an existing shirt for the second version. The armor pieces were painted and weathered using a hamemred chrome spray paint and black and brown acrylic washes. The blood swipe was done with theatrical makeup set with setting powder and Final Seal. When I did the Garrett beard, I had to make that prosthetic myself! The beard itself was a strip of faux fur shaped and trimmed into the right shape, and the mustache was a lace backed mustache purchased a theatrical supply. It was applied using spirit gum, and once it had set, I laid down another layer of spirit gum along the edge, and stuck fur clippings into it to make it appear as if the hair were growing out of my skin. I stippled black cream makeup along the edge and under my neck, and set it with setting powder as well, and ta da! Hawke beard! I'll post more about Alistair, Josie, and the Halamshiral uniforms as we go! I am fairly new to cosplay as a social thing. I think it was last September that I decided I was going to start and I pulled together a very basic Dalish Inquisitor for November's MCM Birmingham, which I kept working on for when we went back to Birmingham in March. At the moment, my Inquisitor has three outfits under construction and I'm working on Warden Mahariel for a photoshoot in August. [QUOTE]Hello all denizens of Thedas! You did a good job on all this stuff. It looks great, and the wins you got for it were well-deserved, so congrats! I've never seen faux fur used for a beard, but that turned out well, too. I read in your costume notes about how the proper term for the process was "engineer" and I wholeheartedly agree with you. I'm currently going through the same crap with blackwall. I finally found a good reference for his stuff but it's still a struggle figuring out what all the layers are supposed to be. And why is everything extraneously studded??? Looking great so far! Gloves seem difficult to me so I'm really impressed when people can make them at all, and those look really clean so far. it's that fanny pack thing he has on the back of his weirdass belt. i made it big enough that i could put my wallet or cell phone in. Belligerent, that looks great! I really need to start thinking about pouches and additional belt accoutrements so that I can stop towing my suitcase of a handbag around with me. Last time, my husband put all my "essentials" (wallet, phone, spirit gum and various bits of makeup) in the pockets of his cargo pants, but I'd feel better if I could carry it all on me. Yay! Two new posts while I was away this weekend for faire and birthday! Lindirinae - Ah! You're on the GW FB page!! :D If you feel the urge, you can friend me on my personal FB that I use to post there. I post more cosplay updates on my personal than anywhere else. But thank you for the compliment! Wow! So you said you started cosplay as a social thing in September? 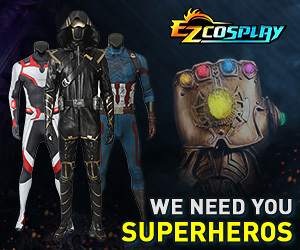 Were you a costumer or a cosplayer before then? Because Dragon Age is SO ambitious for new cosplayers and you look AMAZING in that photo, and that glove craftsmanship thus far is to die for. I'm seriously impressed! :D Leatherworking is tough enough, but to make a GLOVE as well...good work. Very awesome. :D I can't wait to see more! belligerent - Thanks for the compliments on Hawke :D As much as I enjoy wearing the beard for how it looks, though, it's intensely itchy and makes it hard to open my mouth all the way to eat. This is one of the reasons why I usually go out as Lady Hawke, and save the beard for one off photoshoots. YAY Blackwall! It's so true, there's so many layers. Are you doing a particular set of armor or the Skyhold basic gambeson and such? I LOVE the dye job and weathering and stitching - everything~! - on that pouch. I'm sorry, I'm such a costume nerd that I love seeing the awesomeness in people's work. Smart that you made it big enough for your phone too! Here's a few more pictures of things I've done or am working on! Currently, I'm doing repairs on Hawke, and working on three Halamshiral uniforms (my partner, my friend, and I, are going as Cullen, Josie, and Leliana in Winter Palace garb one of these days). No photos of the Halamshiral yet, but soon! Here follows is an Anders cosplay I made for a friend of mine - AGAIN WITH THE STUDDED STUFF! Black leather suede, cotton twill, maribou and duck feathers, and months of black fingers and bloodshed. But she looked really good and really loved it so that's all that really matters. Since I mentioned Leliana earlier, here is the wig I have for that costume! I'm still working on my makeup routine for her, though. It was acting strangely and telling me I had eight photos instead of four. Here are the other two! This is the Josephine costume I made for my friend - the same one who is going to be doing Halamshiral with us! And finally! One of my future cosplays is going to be Warden King Alistair. Sort of a blend of the two in some ways. So I have an early makeup test I did, with a wig that I ended up not using (I went for one with a better shade)! I will be stalking this thread :^) It's certainly an inspiration. @charlemagne; I really adore the details you put in your costumes. I've been looking at your Hawke pictures (I am considering to do marian Hawke as well at some point as I'd love to try armor sometime) and it looks incredible. Your Anders and Josie costumes look absolutely amazing as well. I love the details in it! @Lindiranae; Your costume and that photo looks so pretty (and I love your avatar :'D). Those gauntlets look so hard to do, but they look incredible. @Belligerent; That looks so nice. I actually have a huge weakness for leatherwork and that's gorgeous. I can't wait to see your Blackwall finished. It will be a challenge! School is finally ending soon, so I hope to start this summer. I know real leather is more expensive and harder to work with, but I'm not entirely sure about the quality of faux leather? [QUOTE=Shienra;5025581]I will be stalking this thread :^) It's certainly an inspiration. Thanks for the kind words!! I'm more than happy to give you tips and tell you how I made all of my Hawke cosplay, no worries. My chainmail, by the way, was just a shirt I purchased and removed the bits I didn't need. It was easier than my first version, in which I actually wove the damn stuff. Never again, haha! I actually prefer working with real leather. If you get the right deals, you can get the real deal for close to the same price as pleather, for far more quality. All the leather you see on my Hawke is the real deal. The black leather? 30 dollars for the whole set of three goat hides. The brown leather, was an entire cow!!! for only 100 dollars. I still have plenty left over for other projects. Just make sure you have a machine that can sew garment leather, and use the right type of needles! leather can seem overwhelming to break into but I prefer the real stuff to faux leather. depending on what you're doing, the cost can end up around the same, so there's not much advantage to using fake. there are also a ton of different types of leather, so talking to someone who has worked with it before you buy is a good idea so you know what's appropriate for the project. also i have at least ten leather jackets but i didn't make those. I agree completely - at times, leather can even be cheaper than pleather if you catch the right deals and know where to shop. It also holds so much better, and so much less likely to rip under strain if reinforced. I also find that pleather tends to detach from the fabric backing after a while, but with leather, you don't have that trouble. Don't feel bad, belligerent. I have a crapload of leather, leather suede, veg tan, and cording laying around my room for various projects. XD My closet smells like a leather shop. We didn't make it to the wood (discovered on the way out the door that the camera batteries hadn't been charged, after I'd spent half an hour arguing with my vallaslin :bigcry: ) so I got a shot behind the house as it was getting dark! I love how the gauntlets look - just need to see about matching boot covers now! Now that I know I'm happy with my gauntlet pattern, I can make a start on a pair to go with my new coat. I sadly can't take credit for it - one of the downsides of a costuming and leatherworking parent is that I go to my mother with projects and to ask for advice before I start hacking up expensive leather; the next thing I know, I've been tape-measured by a whirlwind and suddenly I've got exactly what I asked for, just needing buttons and embellishments... which is incredible, but means if I want to learn I have to wrestle things away! We bought the "dragonscale" leather about a year ago from a local leather wholesaler, and I should have just enough left for boot covers and gloves (I hope). Excuse my expression. It says "Oh, another photo? Please can I sit down now, my knees are killing me!" but it's the best shot I've got of the coat so far! I would like to cosplay my Inquisitor since I had to put Cullen on the back burner, but I'm not really sure how I'm going to do it yet. There's just so many options as far as the clothing and armour goes that I haven't even started the process of narrowing down design choices. But when I do finally decide on something, I'll have more to contribute to the thread. Hopefully. [QUOTE=TeaForThought;5025758]I would like to cosplay my Inquisitor since I had to put Cullen on the back burner, but I'm not really sure how I'm going to do it yet. Thank you for the information! :D I think I'm very tempted to buy real leather then.